It has been an interesting year in the credit markets, capped off by a volatile fourth quarter. While the equity markets were being beaten down over the last few months of the year, bonds did not go unscathed. Although U.S. Treasuries were mildly positive for the quarter, both investment grade and high yield corporate bonds had negative returns. There are myriad issues daunting today’s debt investors. High leverage and rising rates are only the tip of the iceberg, and we have observed several other developments beneath the surface worthy of our attention. Despite being a perceived “safer” asset class, leveraged loans underperformed and saw precipitous outflows during the quarter as investors began to reconsider the loose contract provisions they had agreed to over the past few years. These “covenant-lite” contracts greatly limit the recourse a loanholder has if a company does something damaging for existing debtholders, like issue more debt or go on a spending spree. It doesn’t help that the owners of the companies that issue these leveraged loans are often large private equity sponsors with no concern for the debtholders. Time and time again we’ve seen these sponsors bankrupt companies, fleece debtholders, then perform another leveraged buyout a few months later. Caveat emptor. The collateral behind those leveraged loans has also become a concern. As one money manager put it, “You think you’re secured by a Cadillac, but three years from now, it turns out you’ve got a Chevy.” Discounts on new loans have widened to the most in almost three years. We are observing these moves with great interest, as there do exist leveraged loans with reasonable covenants, reliable ownership, and good credit situations that now look attractive. In December, a portion of the yield curve inverted (long-term rates were lower than short-term rates) for the first time in over ten years. The yield curve is followed closely by investors as a potential indicator of pending recessions, as all of the last nine recessions have been preceded by an inversion. The inversion indicates to us that investors are finally starting to appreciate what life might be like without cheap credit and easy money as the Fed continues to raise rates and delever its balance sheet. We would note that, as of today, only a few commonly followed spreads on the yield curve have gone negative. The 2-to-10-year spread is the most closely followed harbinger of an impending collapse and has yet to invert. We would also note that no single metric has complete predictive power. We are not relying on the inversion of the yield curve as a crystal ball that a recession is around the corner, but we are also happy to be invested primarily in high-quality, serviceable debt with near-dated maturities that we believe position us well were a crash to occur. High yield debt is currently in one of the longest issuance droughts on record. This is the first December without a single junk-bond sale since 2008. Volatility in markets, uncertainty about the economy, and a drop in oil prices are discouraging riskier companies from issuing debt. These companies, which are often very highly leveraged as a multiple of their cash flow, need ready access to credit markets in order to refinance debt that is coming due or just to fund their operations. As rates continue to march higher, the cost of capital for these companies will also increase, making it harder to service their debt, let alone earn an attractive return. In short, there are storm clouds gathering over those companies that have relied on cheap credit as their growth engine over the past decade. Before getting into performance, we wanted to note an important update about the management of the Intrepid Income Fund (“the Fund”). As of November 13th, Jason Lazarus no longer serves as lead portfolio manager of the Fund. We are grateful for the diligence and discipline he contributed while at Intrepid and wish him all the best in the next chapter of his career. Going forward, Mark Travis and Hunter Hayes will serve as co-lead portfolio managers of the Fund. Investment grade corporate bonds returned a tepid -0.06% for the quarter, as measured by the ICE BAML US Corporate Index. The lower quality ICE BAML US High Yield Index saw a drop of -4.67%. 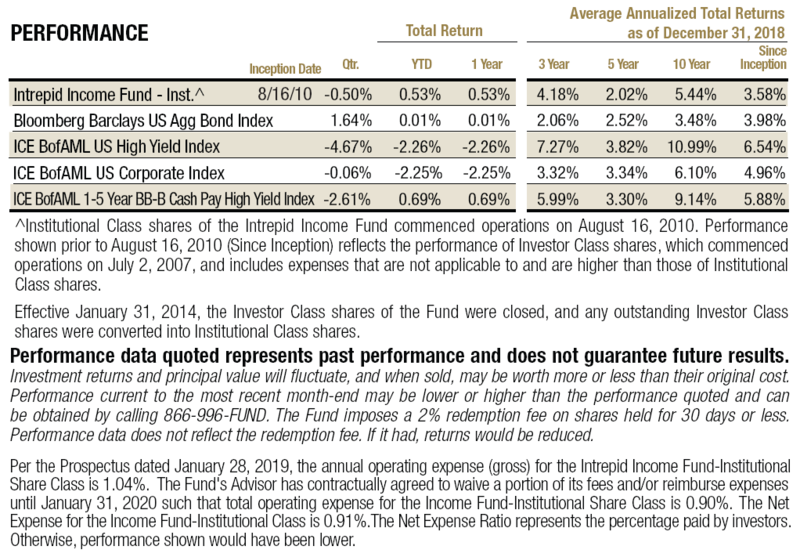 Given the Intrepid Income Fund’s shorter duration and higher quality biases, we also cite the performance of the ICE BAML 1-5 Year BB-B Cash Pay High Yield Index, which returned -2.61% in the quarter. We saw a reversal of last quarter, when weaker credit quality generally produced the best returns, with CCC-rated issues this quarter returning -10.35%. The Income Fund returned -0.39% in the fourth quarter. We continued to look for short-term investment grade bonds that we believe will produce attractive risk-adjusted returns relative to Treasury bills. Last quarter that worked against us, but this quarter it offered some cushion from the turmoil that roiled lower-rated issues. We are judicious about our high yield holdings and look for issues on the higher end of the quality spectrum. Although we don’t ever like losing money, we are pleased with the performance this quarter relative to our benchmarks, and believe we are well positioned for 2019. 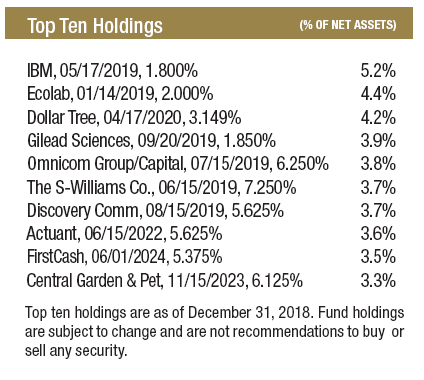 The Fund’s top contributors for the quarter were U.S. Treasuries, Ecolab Inc. 2.0% due 1/14/2019, and Sherwin Williams Co. 7.25% due 6/15/2019. The Fund’s top detractors for the quarter were Donnelley Financial Solutions Inc. 8.25% due 10/15/2024, Consolidated Tomoka Land Co. 4.5% due 3/15/2020, and FirstCash Inc. 5.375% Notes due 6/01/2024. None of the contributors for the quarter were material. The detractors were down because of the broader sell-off in higher-beta credit names, not because of any credit-specific issues, and weren’t down meaningfully. We believe these detractors also traded off because of forced year-end selling and a lack of liquidity. For the most part, the Fund continued to clip coupons for three months despite the slight drop in principal for our higher yielding holdings. For the year, investment grade corporate bonds returned -2.25% as measured by the ICE BAML US Corporate Index. The lower quality ICE BAML US High Yield Index fell 2.26%. The ICE BAML 1-5 Year BB-B Cash Pay High Yield Index returned 0.69% for the year, reflecting the market’s preference for shorter-term maturities and newfound disdain for the lowest-rated, riskiest credits, which are exempted from this relatively well-performing index. The Income Fund returned 0.53% for the year. We were able to outperform by shifting into higher-quality credits, limiting duration, and avoiding some of this year’s land mines. Our top contributors for the year were Primero Mining Corp. 5.75% due 2/28/2020, FTI Consulting Inc. 6.0% due 11/15/2022, and U.S. Treasuries. Our top detractors for the year were Retail Food Group common stock (ticker: RFG AU), Corus Entertainment common stock (ticker: CJR/B CN), and Consolidated Tomoka Land Co. 4.5% due 3/15/2020. We have written in previous letters about these contributors and detractors. We argue there is a vital need for active management in this sort of fixed income environment. Passive index funds for debt securities appear to function tolerably well in times of low volatility but are not designed for the sort of volatility we have been experiencing lately, in our opinion. Many fixed income ETFs had major drawdowns in December. When there are outflows in these products, traders have to liquidate bonds and loans in order to meet redemptions. This can be a problem given that liquidity in many of these securities is extremely thin, and price discovery sometimes takes a while to play out. Hence, the forced sale often leads to a significant haircut to the price one would expect to get in orderly circumstances. We saw the inklings of forced selling play out in December, but it could get a lot worse with an even larger drawdown. We prefer to be the ones buying these discounted securities at clearance-level prices. We remain vigilant in seeking to preserve your capital during this volatile period. We believe the best place to be right now is in high-quality, liquid credit with short-term maturities. There are exceptions, of course, but we are being very selective about adding anything with risk or duration. As prices continue to gyrate, and our short-term maturities come due, we will reassess the risk/reward opportunities that the market is offering and selectively move into higher-risk debt securities when it makes sense. As always, our top priority is generating stable, reliable income and avoiding any situations that put your hard-earned principal at risk. We are proud of the fact that we have never had a credit holding default in the Fund. We will continue to follow a rigorous process to find attractive fixed income investments and be exceptionally discerning when lending businesses money. Thank you for your investment. All investments involve risk. Principal loss is possible. Investments in debt securities typically decrease in value when interest rates rise. The risk is generally greater for longer term debt securities. Investments by the Fund in lower-rated and non-rated securities present a greater risk of loss to principal and interest than higher rated securities. The Fund may invest in foreign securities which involve greater volatility and political, economic and currency risks and differences in accounting methods. The ICE BofAML US High Yield Index tracks the performance of US dollar denominated below investment grade corporate debt publicly issued in the US domestic market. Qualifying securities must have a below investment grade rating (based on an average of Moody’s, S&P and Fitch), at least 18 months to final maturity at the time of issuance, at least one year remaining term to final maturity as of the rebalancing date, a fixed coupon schedule and a minimum amount outstanding of $250 million. Bloomberg Barclays Capital U.S. Aggregate Bond Index is an index representing about 8,200 fixed income securities. To be included in the index, bonds must be rated investment grade by Moody’s and S&P. ICE BofAML U.S. Corporate Index is an unmanaged index of U.S. dollar denominated investment grade corporate debt securities publicly issued in the U.S. domestic market with at least one year remaining term to final maturity. The ICE BofAML 1-5 Year BB-B Cash Pay High Yield Index is a subset of the ICE BofAML US Cash Pay High Yield Index including all securities with a remaining term to final maturity less than 5 years and rated BB1 through B3, inclusive. You cannot invest directly in an index. Bond ratings are grades given to bonds that indicate their credit quality as determined by private independent rating services such as Standard & Poor's, Moody's and Fitch. These firms evaluate a bond issuer's financial strength, or its ability to pay a bond's principal and interest in a timely fashion. Ratings are expressed as letters ranging from 'AAA', which is the highest grade, to 'D', which is the lowest grade. Yield is the income return on an investment. It refers to the interest or dividends received from a security and is usually expressed annually as a percentage based on the investment’s cost, its current market value or its face value. Investment Grade (IG) is a bond with credit rating of BBB or higher by Standard & Poor's or Baa3 or higher by Moody's. Cash Flow measures the cash generating capability of a company by adding non-cash charges and interest to pretax income. Duration is an approximate measure of the price sensitivity of a fixed-income investment to a change in interest rates, expressed as a number of years.